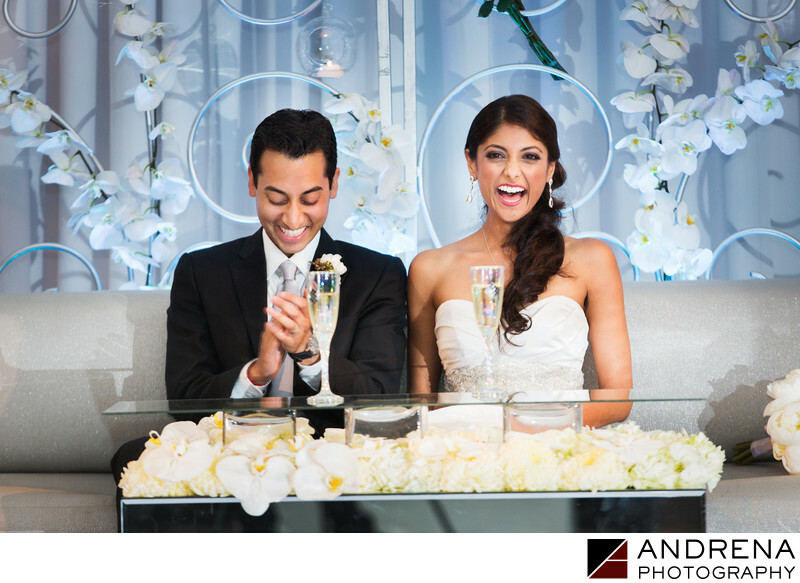 I love this sweet photo of this couple laughing at a toast being given at their St. Regis wedding in Monarch Beach, California. It is always an honor to shoot two weddings in one family, so when this bride called, I was truly flattered, as I had the privilege of photographing her sister's wedding a few years prior. The two brides chose different venues (St. Regis for this wedding, the Montage for her sister's wedding), and very different decor palettes. But they were equally sweet, and I consider myself lucky to have gotten to work with them. The wedding reception palette was blue and white, with beautiful flowers and design provided by Fayaz at Bloom Box Designs. The decor scheme included Lucite chairs, a fully draped room, and beautiful candles everywhere. Coordination was provided by Nutan Shah at Elegant Events, and she and her team helped the day move along without a hitch. This bride chose to wear a traditional Indian lengha for her wedding ceremony, and a white wedding dress for her reception. Both looks were stunning, as were this couple's smiles. Indian wedding photographed at the St. Regis in Monarch Beach, California.